Creating content for your business can be touch when you are busy doing everything else. 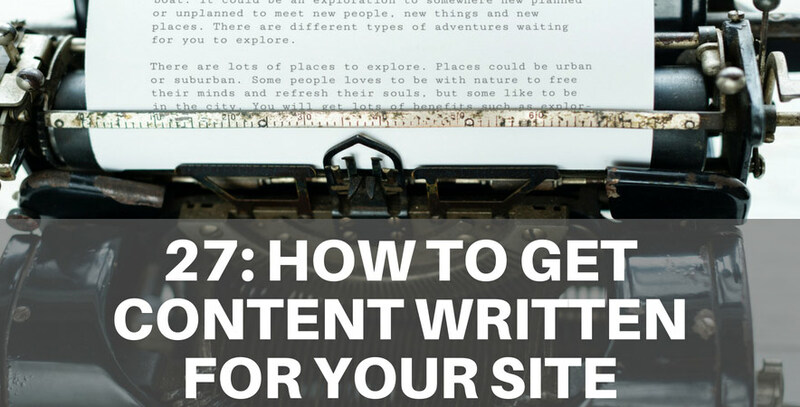 In todays episode, we talk about how to get content written for your site so you don't have to do it yourself. Edmund: Good morning Darryl how are you? Edmund: yeah I think we'll just walk through the various options that are available to them I think it's important to note though that there are some pieces of content that I think that you as the business owner need to be committed to creating or writing yourself right especially when it comes to your product or service and especially when it comes to you know things like how your product or service deals with how it solves your customers problems right so I guess the general idea we're talking about here is you know people say that you need to be writing ongoing content and blogging and stuff like that will give them some ideas about how where they can get that created but right out of the gate you you can't avoid doing some writing that's what I would say first up would you agree? Darryl: how do I go about getting someone to write for me? Darryl: what's what the local writer? Darryl: what other things do we need to think about getting content written for your site?